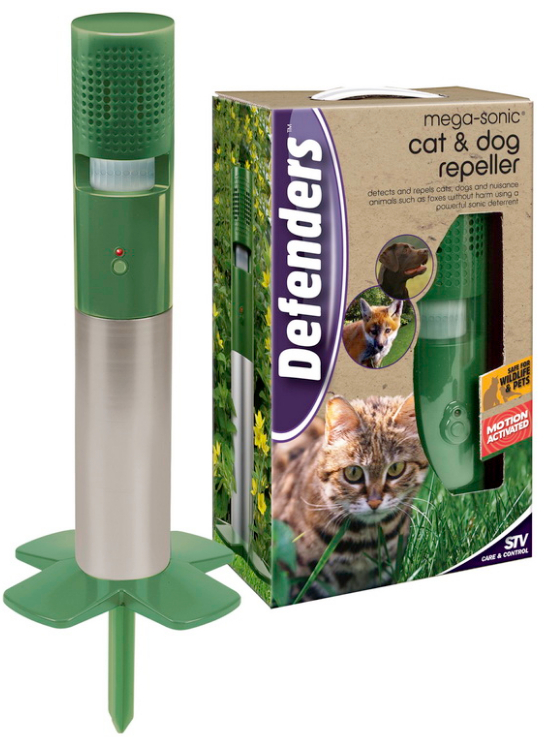 The Ultrasonic Cat, Dog and Fox repeller / repellent scarer is a garden cat deterrent that will rid you of unwanted cats, dogs and foxes. This cat repeller comprises of a twin speaker system that maximizes dB output to ensure wider coverage of areas. A motion activated sensor detects animal movement and activates the ultrasonic sound that cats and dogs don't like (humans cannot hear it). The cat repeller also features push button "test" with LED activation so you will always know your cat deterrent is working. This cat deterrent is easy to set-up with ground anchor and adjustable stand height. Detects and repels cats, dogs and nuisance animals such as foxes without harm. Coverage area is up to over 220 square metres.